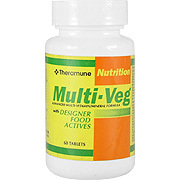 Advanced multi-vitamin/mineral formula with designer food actives. 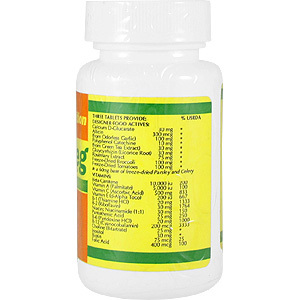 As a dietary supplement, take 3 tablets daily - 1 with each meal. Designer food actives: 30mg Calcium D-Glucarate, 300mcg Allicin, 100mg from Odorless garlic, 10mg Polyphenol catechine, 30mg from Green tea extract, 30mg Gluycyrrhizin (Licorice root), 75mg Rosemary extract, 100mg Freeze-Dried broccoli, 100mg Freeze-Dried Tomatoes. In a 60mg base of freeze-dried parsley and celery. Vitamins: 10,000iu Beta-Carotene, 5,000iu Vitamin A (palmitate), 500mg Vitamin C (ascorbic acid), 200iu Vitamin E (d-alpha toco), 20mg B-1 (thiamine HCI), 30mg B-2 (riboflavin), 30mg Niacin: niacinamide (1:1), 25mg Pantothenic acid, 20mg B-6 (Pyridoxine HCI), 200mcg B-12 (Cyanocobalamin), 25mg Choline (bitartrate), 30mg Inositol, 75mcg Biotin, 400mcg Folic acid. Minerals: 200mg Calcium (citrate: carbonate 1:4), 125mg Magnesium (glycinate: oxide 1:4), 75mg Potassium (citrate), 10mg Zinc (citrate), 2mg Copper (citrate), 100mcgMolybdenum (molybate), 150mcg Iodine (kelp), 50mcg Selenium (l-selenomethionine), 200mcg Chromium (citrate), 3mg Boron (potassium borate), 10mg Silica (colloidal silica), 225mg Organic horsetail, 50mcg Vanadium (vanadyl sulfate). 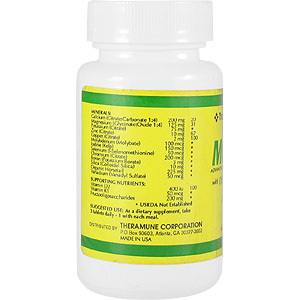 Supporting nutrients: 400iu Vitamin D2, 50mcg Vitamin K1, 200mg Fructooligosaccharides. MultiVeg is shipped in a discrete, unmarked package. Orders are processed immediately and usually take about 3 to 5 working days to be received. We do ask that you try it for 2 to 3 weeks to feel the full effects. Any information received is used only for order processing and shipping purposes. Your information, such as e-mail address, will never be disclosed to a third party.